That post included the following poll. The results are shocking! In January of 2013 I began a series of posts to explore the rationale (if there is one) for “citizenship-based taxation”. I simply cannot understand how the United States of America, a country that once was a leader in human rights, can treat it’s citizens (not to mention Green Card holders) so badly. I assume that Congress has simply not considered this issue. Cook v. Tait 1: Does Cook v. Tait really mean that citizenship-based taxation is constitutional in all cases? Cook v. Tait 4: Taxation of #Americansabroad based on US culture 150 years ago! Time warp or what! Cook v. Tait 5: Citizenship-based taxation was never justified – League of Nations reports! Cook v. Tait 6: Taxation of Green Card holders who reside outside the U.S.
Cook v. Tait 8: Does citizenship-based taxation cross the boundaries of tax justice? In our country the people are sovereign and the Government cannot sever its relationship to the people by taking away their citizenship. Our Constitution governs us and we must never forget that our Constitution limits the Government to those powers specifically granted or those that are necessary and proper to carry out the specifically granted ones. In Cook v. Tait 11 I discussed the “citizenship penalty” and the equal protection component of the 14th amendment. I argued that the “citizenship penalty” violates the constitutional guarantee of “equal protection”. Citizenship classifications are reviewable according to the standard of “strict scrutiny”. This post will discuss citizenship-based taxation in conjunction with the first part of the 14th amendment (“All persons born or naturalized in the United States … are citizens for the United States”). The United States government has a shameful history of using citizenship as a weapon against its citizens. Examples including the pressuring Japanese detainees in World War II to renounce their citizenship, taking citizenship for reasons enumerated as “expatriating acts” in S. 349 of the Immigration and Nationality Act, and most recently the Reed-Schumer proposal to ban “covered expats” who renounce citizenship from the United States permanently. The blogger “Eric” at the Isaac Brock Society has researched the history of what I would call “citizenship abuse”. His posts are a wonderful documentation of an extremely nasty part of U.S. political culture. Senators Reed and Schumer are simply the most recent examples of a sadistic “Congressional Thugocracy” that seems to take delight in inflicting pain on U.S. citizens who leave the Homeland. 1. The right to be a United States citizen if you were born or naturalized in the United States. In other words, the Schumers and Reeds of the world cannot take your citizenship from you. It’s yours. It’s one of the few things the government can’t steal from you. 2. The right to relinquish your citizenship. Your U.S. citizenship is yours. You are free to “take it” or “leave it”. Until recently most people were enthusiastic about “taking it”. Now large numbers of people are enthusiastic about “leaving it”. Renunciations are on the rise. The Obama administration has unleashed an unprecedented, unprovoked, unreasonable, unjustifed and unprincipled vicious assault on U.S. citizens abroad. As a result, many are renouncing their U.S. citizenship to protect themselves and their families. 3. Justice Black’s decision in Afroyim strongly states that the 14th amendment protects citizens from the “forcible destruction of their citizenship”. This means the “forcible destruction” of all incidents of citizenship. Incidents of citizenship include both the right to retain and the right to renounce. A. The government cannot put you in a position where you are forced to renounce your citizenship. “Obama Tax Terrorsism” anyone? B. The government cannot create conditions which make it impossible or unduly burdensome for one to renounce citizenship. Exit tax anyone? Citizenship is no light trifle 268*268 to be jeopardized any moment Congress decides to do so under the name of one of its general or implied grants of power. In some instances, loss of citizenship can mean that a man is left without the protection of citizenship in any country in the world—as a man without a country. Citizenship in this Nation is a part of a co-operative affair. Its citizenry is the country and the country is its citizenry. The very nature of our free government makes it completely incongruous to have a rule of law under which a group of citizens temporarily in office can deprive another group of citizens of their citizenship. We hold that the Fourteenth Amendment was designed to, and does, protect every citizen of this Nation against a congressional forcible destruction of his citizenship, whatever his creed, color, or race. Our holding does no more than to give to this citizen that which is his own, a constitutional right to remain a citizen in a free country unless he voluntarily relinquishes that citizenship. In 1776, the United States declared independence because the mother country on the other side of the ocean was imposing taxes on the colonies for the benefit of England. Resentment started when Britain tried to enforce the Navigation Act after 1763. Resentment increased with the Stamp Act in 1765, a way for Britain to tax the colonies. The British Tea Act of 1773 led to the Tea Party and we all know the outcome – the American Revolution and independence crying out “no taxation without representation”.  In 2001, the Patriot Act made anything foreign suspect, including Americans residing overseas.  In 2004, Congress, under the Jobs Act, drastically increased the FBAR civil and criminal penalties to confiscatory levels, creating a disguised form of taxation on assets held overseas.  In 2006 administration of the FBAR reports was transferred to the IRS for enforcement.  In 2006 the Tax Increase Prevention and Reconciliation Act (TIPRA) extended the Bush tax cuts and included a compensatory revenue raising provision that reduced the benefit of the foreign earned income exclusion, limited the foreign housing allowance and pushed Americans overseas into higher tax brackets, thereby increasing U.S. tax liabilities for many Americans abroad.  In 2008 the law relating to renunciation of U.S. citizenship was revised under Section 877A and introduced an Exit Tax on wealthy individuals (defined as “covered”). The law also provided that Americans who inherit from estates of former “covered” U.S. citizens are subject to U.S.
 In 2009 the IRS launched its initiative against tax evasion linked to foreign assets through the Overseas Voluntary Disclosure Programs and a threatening public relations campaign. While it justifiably targeted U.S. resident tax evaders, it simultaneously trapped Americans abroad who necessarily have foreign assets. The IRS’s one size fits all policy and bait and switch tactics led to abuses of Americans abroad which inspired sharp criticism from the National Taxpayer Advocate.  In 2012 S.3457 proposed to grant the IRS the authority to have a U.S. passport cancelled or not issued if the IRS determined that the individual owed $50,000 or more U.S. tax.  In 2013, S.268 was introduced; it compounds difficulties created by FATCA.  In 2013 the Senate Finance Committee included in its tax reform recommendations a provision which would grant the IRS authority to cancel a U.S. passport for tax collection purposes. The United States is literally destroying the community of Americans abroad, which plays an essential role in representing U.S. interests and goodwill overseas. The United States is shooting itself in the foot. The decision of Justice Black in Afroyim v. Rusk states that the forcible destruction of U.S. citizenship is unconstitutional. Jackie Bugnion’s “plea” to the Ways and Means Committee is as clear a statement of the destruction of U.S. citizenship that there could be. What exactly is causing the forcible destruction of U.S. citizenship? It is NOT citizenship-based taxation that is causing the forcible destruction of U.S. citizenship. It is “residence based life control” that is forcing the destruction of citizenship. Those who are in compliance with the rules of “residence based life control” are “life compliant”. There are two types of U.S. citizens abroad: those who are “life compliant” and those who are not “life complaint”. Notice I am not saying “tax compliant”. I am saying “life compliant”. It is entirely possible to owe zero taxes and still not be in compliance with all the other obligations entailed by exercising (what Democrats Abroad call) the “privilege of living abroad“. “FATCA, FBAR, OVDI, OVDP and the rest of the Treasury/IRS/HIRE/IGA alphabet-soup train wreck that is coming down the tracks to destroy the lives of U.S Persons abroad, and ultimately the homeland United States as well”. It is NOT the paying of taxes that is the problem for U.S. citizens abroad. The problem is the “requirements of residence based life control” – which are NOT about taxation – but operate to effectively lock U.S. citizens abroad in a fiscal prison that makes their lives impossible. The U.S. government takes the position that citizenship-based taxation is constitutional. That may or may not be. The U.S. government cannot by calling something at tax, claim that it is justified pursuant to Cook. v. Tait. Although the constitution may allow the U.S. to tax U.S. citizens abroad on their world income. It cannot do it in a way that results in the “forcible destruction of their citizenship”. I have long argued that the problem is NOT citizenship-based taxation per se. The problem is the rules that are applied to U.S. citizens abroad. The problem i is that the rules that are applied to U.S. citizens abroad are the same rules that are applied to Homelanders. The reporting requirements apply to all U.S. citizens. The truth is that reporting requirements apply disproportionately to U.S. citizens abroad. I suspect there are very few Homelanders who have ever heard of the “alphabet soup” collection of forms that apply to U.S. citizens abroad. There is no reason why U.S. citizens abroad should be subjected to the same rules as Homelanders. In a previous post I argued that under the current rules U.S. citizens abroad are subject to discrimination that may violate the 14th amendment guarantees of equal protection. U.S. citizens abroad are subject to “citizenship penalty” in the way they are taxed. There are other ways to ensure that U.S. citizens abroad pay their “fair share”. For example, U.S. citizens abroad could simply be charged an annual “fee” to maintain citizenship. Jackie Bugnion and others who sent their submissions to the Ways and Means Committee have it right. “Residence-based life control” is forcing people to renounce their citizenship. 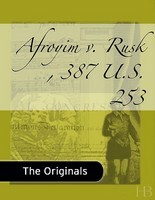 The forcible destruction of citizenship is in conflict with Afroyim v. Rusk. There is choice only in a “logical sense”. The reality is that “residence based life control” is the equivalent of “constructive dismissal” in an employment context. Imagine you have an employee that you want out. Imagine that you can’t legally fire the person. You should make it impossible – through threats and harassment – for them to continue the job. The reporting requirements, compliance costs, threats and penalties are causing the “forcible destruction of U.S. citizenship”. Those who are NOT “life compliant” have to live with the fear of being branded criminals and all the consequences. Those who attempt to be “life compliant” are in a far worse situation. The harder Americans Abroad try to be “life compliant” the greater the risks. Congress is forcibly destroying U.S. citizenship for all U.S. citizens abroad. Congress may have the right to tax U.S. citizens abroad. But, U.S. citizens have the right to NOT have their citizenship destroyed by the incidents of that taxation. Most of what Congress calls “citizenship-based taxation” is actually “residence based life control”. What would the United Nations think? My whole life has changed because of this. I’ve felt immense grief that the only way to deal with and move on is to renounce. I always assumed if you were born some place you were entitled to that citizenship without any other need of proof. As long as you didn’t commit treason or some serious crime you were a citizen. I had never, once heard of an FBAR! I called the IRS many times over the years to make sure I still was within their rules and nobody every mentioned such a thing. Nobody mentioned when after 9/11 we were required to get a U.S. passport either. Some have said that it’s written on page 4 of the passport. Well, my vision is VERY bad even with glasses and I never even attempted to read those pages. I assumed if it was anything important I would have been told about it and barely glanced at the tiny,tiny print on those pages. Couldn’t someone have informed us when we landed here? In fact up until I had to get a U.S. passport I wasn’t too sure I was even a citizen there anymore sometimes since the person I spoke with when I landed at Buffalo insisted over and over that “You may lose your U.S. citizenship over this” So when I went for that passport in the back of my mind I was worried they might not give me one. When they did I mentioned the fact I’d been told I might lose my citizenship and the person there did say “No, you were misinformed.” I came here in 1980 so maybe the rules were different or something back then but, I only landed and had not taken citizenship. The constant worry about money and fines, fees, penalties. The hours and hours lost trying to figure out the right paperwork, how to fill it out, who to trust or not and how in the bloody hell to pay for this “compliance” has made my rheumatoid arthritis flare up over and over when it was under control before. I have been in the hospital once with a terrible breathing problem they couldn’t get under control except for the use of steroids over a long period. I now think this was brought on by extreme stress. The situation was so bad at the hospital that I was questioned about extensive measures and did I want to be “revived” if things got worse. That situation also made my son’s illness worse since one of the things wrong with him is severe panic disorder and depression. He was there and had to witness the situation in the emergency room and hospital. I have no doubt in my mind at all that I was made sicker by worrying over this and fretting day in and day out. Loss of sleep, constantly trying to figure out “the right thing” only to find out that not even the IRS knows the “right thing” many times. I found out about all this after the death of my mother and in the midst of dealing with a very difficult sibling. I wouldn’t have owed them a thing. In fact they owed me 600 dollars which I am afraid to claim. I still believe there are thousands of people who do not yet know about this at all! I’ve had my tax forms prepared twice at quite an expense and I’m sure the paperwork is wrong and so have not sent it in. I have not done FBARS as I would need help with them and cannot afford it. My sons illness has flared really badly twice since I found out about this and some of his treatments are very expensive so any “extra” money I have goes to that. Not that we have any “extra” money! How can anyone actually say how much they are affected by this since it just invades every area of your life. I haven’t been able to put this on the back burner and not worry about it even when something good is happening. As I said above I have one sibling who is a very, very difficult person and so telling my family I’m renouncing has been just peachy. That sibling will use this for the rest of my life to portray me as a “bad” person to other family members at every opportunity. So not only did it strain my marriage, it put me in the position of being a perpetual “black sheep” who will be “tolerated, pitied and disliked” an outsider, not “one of them” I’m so looking forward to having to deal with the dynamics that will go on once I have renounced. Some will know better but, others won’t. Lately, this situation has lead to problems with my spouse because I haven’t renounced yet. It’s not that I don’t want to. I am terrified to go forward and file all that mess should a penalty be assigned to me. And tax payer advocate or not, I am just not in any physical shape right now to drag myself through such an ordeal. It’s GOT to be done but, this is such a catch 22! This stupid witch hunt which people inside the U.S. think is going after the uber rich “off shoring” in “tax havens” has done more to harm low and middle income “targets” than anything I’ve seen them do down there in a long time. I have learned a hard lesson about what citizenship taxation is and what it means. I’m sickened by the comments I see on certain U.S. based articles. Is this who they really are?? Oddly, I think not. I think if it were happening to THEM they’d have a completely different opinion which makes them very selfish. The thing I am most angered about at the moment is that comment by President Obama last week that they are paying to fix their infrastructure by “repatriating taxes” First off that is a LIE, it’s NOT “taxes” It is fines and fees and penalties on paperwork nobody ever heard of outside the U.S. for the most part and they know it. If it were taxes it would even come close to being enough as according to American Citizens Abroad 82 percent of expats would owe zero taxes. Secondly, it told me that all this suffering was PLANNED. That they are NOT going to RBT and do not ever want to. That they know what they are doing and know no one inside the U.S. will care. As some here have said it’s not the America we grew up in for those of us that did grow up there. Or maybe it is and we’re just now seeing how they operate with those that don’t live there. At any rate the feeling of betrayal and back stabbing runs deep. Like many of you I have spent decades here feeling I had to defend the U.S. at times and stand up for Americans because I felt many times they were all negatively portrayed and not all Americans are bad people. I had to deal with this daily since my mother in law was staunchly anti American. Coming to a new country and having to deal with her hurtful remarks was hard but, I DID win her over. Her and most people who got to know me well. I feel the U.S. is losing something they cannot get back. They can never make us back into good will ambassadors ever again. There was little justification for us to do that in many cases to begin with and now there will be none. At any rate my main worry is keeping MY health up because my son needs me to be healthy. I can’t help him when he needs it if I go down too far. I’m just going to renounce, file what I can by sending it straight in and not going into any “program” as I do NOT trust ANY of their “programs” Why they would put families abroad who would not owe them a dime in taxes through this is beyond shocking to me. As Obama said they are going to rebuild their infrastructure by “repatriating taxes” NO it’s not “taxes” It is fines and fees and penalties on zero taxes owed in most cases. Who ever thought up such a plan and feels it is right is an immoral, vicious jerk. I now believe there is no hope for them to resolve any of this with residency based taxation as the evidence and Obama’s comments show this was planned and is being done on purpose so why on earth would the let any minnows go and not penalize them? Interesting commentary from a number of U.S. citizens abroad, some who feel they are forced to renounce their citizenship is here.